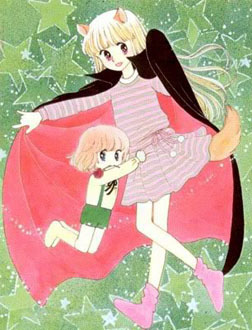 Ranze Etou is an adorable immortal girl with a vampire father and a werewolf mother who would throw things at each other when they get into childish fights. However, Ranze just wants to live like a normal girl and lead a normal life. Unfortunately, she is “blessed” with the power to turn into anything she bites. For example, if she accidentally bites a cake the wrong way, then she will turn into a cake. The only way to return to normal is to sneeze! Ranze is in love with Shun Makabe, who is a handsome human boy at school. However, a human girl (without much hair) named Youko also likes Shun, and she would do anything to reveal that Ranze is not a human!! Things got even more complicated when Ranze met Aaron, who is the prince of the Spirit World. Aaron fell in love with Ranze and first sight, and he would do whatever it takes to win her away from Shun… Tokimeki Tonight was one of the hottest mangas in Japan, and you sure don’t want to miss this hilarious comedy! Please continue to give this series some love. I love love love this manga! So funny and cute! Please release more chapters. Thanks! I really like to read this manga ♡♥,,first,,thank you for the hard work! And please continue to release the next chapters,,,ganbatte !! This manga is one of my favorites and I notice that it’s still in your current projects… But why haven’t you updates this one? Are y’all going to keep working on this? I really love it and it was getting so juicy! I want to know what happens! Thanks for the work you’ve done on it so far! I really love this manga so much! Why hasn’t it been updated in so long? Please keep working on this! Hey. Has this been dropped? Last chapter more than a year ago. I ask because my scanlation group would be interested in picking it up if you’re not doing it anymore. Is this still being translated or no….? It hasnt been updated in a year in a half. Im just a reader. That project is on a bit of hiatus right now, we will get back to it as soon as possible. I really love this manga. I just hope you won’t drop this. It’s such a gem. Thank you for your hardwork! I really love this manga and I’m wondering if it will ever be continued ? Please don’t drop it!